Alaric Moebius and Basil is back in this the third volume of adventures. They are still bound to find artifacts to the mysterious "Collector" but are looking for a way to get out of their servitude. Now it seems like they finally will get their wish as they are learning the origin of "the Collector", through 13 old stone discs that tell the history of the Ancients, a mythological race of godlike creatures that once was worshiped on earth. It was quite nice to once again to be reacquainted with Alaric Moebius and Basil. But, even though I enjoy reading these kinds of adventures graphic novel do I prefer a more serious note. The banter between Moebius and Basil and the humorous tone with women they meet etc. just doesn't always appeal to me. It can be too much. I found I grew a bit impatient with the story.Still, it nice to read something action-filled once in a while. And, I did enjoy learning more about the Collector. And, I loved that we get to met Basil's mother. Even though I didn't always like the humor did I enjoy the humorous part with her. I will say that the last 1/3 of the book was my favorite part with Moebius and Basil realizing that they may have done a big mistake. And, despite the ending have I a feeling that they are not really off the hook yet!The art is ok, I can't say I love it. It's nothing that really takes my breath away when I read it. But, I don't dislike it, it suits this kind of story. I want to thank the publisher that provided me with a free copy through NetGalley for an honest review. 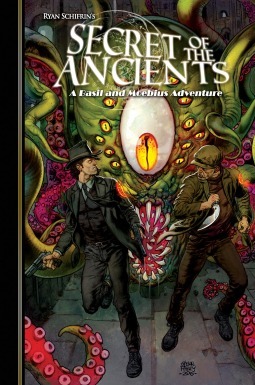 In 'The Adventures of Basil and Moebius, Volume 3: Secret of the Ancients' our two adventurers are still scoundrels. They are also still politically correct like 1970s men's adventure novels.This time around, they've managed to find a stone disc that may help them decipher the strange tattoos that their demonic master, the Collector, has given them. The problem is that groups of hooded people with poison knives and sharp swords are also interested in retrieving these items as well. While Basil and Moebius find themselves on the run, the Collector finds himself under attack, but it's nothing his tentacles and sharp teeth can't dispatch with. They guys end up finding out more of the mystery behind the Collector and where he came from. With some crazy inventions, including the Spring Heel Jack suit from a previous issue, they avoid death on more than one occasion.I read the first volume when it came out and I really didn't like it. When this volume came up for review, I decided to give it another try. It's still overly Brit-slangy. It's also sexist, but many comic books are. I did like that this issue was more one cohesive story instead of a few of them. The whole thing still feels a bit dated in ways, but it's growing on me. The action is ludicrous like James Bond movies are, and our protagonists are luckier than they should be.I received a review copy of this graphic novel from Diamond Book Distributors, Magnetic Press, and NetGalley in exchange for an honest review. Thank you for allowing me to review this graphic novel. It's always a little hard to come into a series several volumes in. I'll be honest, I didn't really "get it" but was still able to follow the story in some manner of fashion. To me, the book seemed a bit disjointed, but that could just simply be because I was missing some of the backstory. The characters were funny and amusing at times, while at others seemed a bit forced. I don't think I'll be trying for another one of these books, but I enjoyed this novel well enough. The story of The Ancients was intriguing, so I'll give it a solid 3 stars for that! This is the story of two guys that have somehow become enslaved via mystical tattoos to a shape shifting tentacle monster from another dimension called The Collector. The Collector has been sending them around to steal ancient artifacts around the globe for some reason they don't know about. They aren't too keen on being slaves so are actively trying to find out what he's up to so they can free themselves from his control.I thought the story was pretty interesting it has a bit of an Indiana Jones / National Treasure vibe to it. I haven't read the first two volumes so I can't say how this flows out of those but I was able to follow the story without feeling confused. The art is well done, consistent, finely detailed and vibrantly colored. My only real complaint about the book is the feeling that a lot of the dialog is a bit over the top. The guys are supposed to be from the UK, I think and something about it felt off to me. Other than that it's a fun story if you are interested in pulp horror adventure stories.Extended review with pictures:https://stabbingstardust.wordpress.co...I selected this book from NetGalley's Read it Now selections in exchange for my feedback and a review. Alaric Moebius and Basil Fox are two gentlemen-rogue fortune hunters. They are bound to a mysterious being called the 'Collector' who forces them to hunt for artifacts. This is their third adventure.In this story the two men are seeking a way to free themselves from the ties and powers of the Collector. They have stolen an ancient stone disc which they hope will show them how to rid themselves of the Collector. The disc reveals the secrets of the ancients but alas there are many people after this disc including the collector himself, gangsters, governments and members of a cult. Basil and Moebius find that they are going to have to stay ahead of everyone else in this race to find the disc and they find that this is far easier said than done. It also involves a huge amount of running, fighting, ducking and diving, and using state of the art weaponry. This is a good graphic novel with an interesting story, enjoyable characters and a fast pace. Adventures stories are not usually my thing but I did enjoy reading this one. The comic has a 'Raiders of the Lost Ark' feel to it and it is action packed. It was ok to read but I thought the artwork was a little too dark in places. Great banter between the characters though.A good series to get into for graphic novel fans!Copy provided by NetGalley in exchange for an honest review. For fans of Raiders of the Lost Ark or Laura Croft, this is a graphic novel to read. This title has it, action, adventure, snarky main characters (Moebius and Basil) who always seems to find a way out of even the most perilous of situations. Working for a mysterious client, Moebius and Basil set out to find ancient relics with untold powers. Their adventure includes periods of graphic violence as they encounter various adversaries. The witty story line flows nicely and quite fast as the main characters travel around the world on their quest. The ending, and all of the tight situations, seem to work out perfectly for our heroes. The violence and mature situations in the book would qualify it for an older audience, high school and above. The female characters in this work lack depth; their presences is used to further the plot rather than develop them as characters. This is evidenced by their hyper-sexualized clothing and interactions with other characters. I received a copy of this book in exchange for an honest review.First of all, even though this is the third volume it is the first one in the series that I have read. That being said, there were some things that I was in the dark about, but things that happened in this volume were still explained well enough to enjoy it. This was an interesting story that seemed to come with its own mythology. The characters were sassy (always a plus) and I appreciate how dedicated they were. I'd be interested to see what else is in store for these two. Basil and Moebius are seeking to escape from the Collector's curse and get rid of their brands. They end up teaming up with Sophie from Mossad. Between fighting cultists in China, England, Turkey and Crete, they and Sophie had hair-raising adventures and plenty of fights. Plus you get to meet Basil's Mum. If you enjoyed earlier volumes, read and keep up with the team of "screw-ups" (as Sophie calls them). Our dashing heroes try to rid themselves of the curseIn this third volume of the adventures of Basil & Moebius, two adventurers, they find themselves involved in supernatural plots involving their employer, the Collector. They are trying to free themselves from his dominion. The plot involves Triads, the Mossad, globe-trotting and loads of monsters.Colourful and well-illustrated, this works quite well but there is an awful lot of plot explanation which tends to spoil the pace. A fun, entertaining adventure featuring two rogues trying to stop the elder gods from returning to earth. What I didn't like about the book is the coloring. It looks like it was done by someone who just discovered a new toy. There are so many light sources and dark spots in each panel it's distracting and unnatural. It's so bad that I would have preferred a black and white comic.Received an advance copy from NetGalley in exchange for an honest review.